Folly – noun; plural noun: Follies. A costly ornamental building with no practical purpose. Having been a member of the Victorian Military Society for more years than I’d like to admit, I’m always keen to explore any museum or collection which furthers my interest in the topic. Last year, during my summer holiday to Dorset, I visited Nothe Fort; a Victorian coastal fortification just down the coast from where I was staying. Nothe Fort with Portland Bill visible across the bay. The fort is covered by earth; a 20th century form of protection which obscures much of the old gun ports. Weymouth, being a seaside resort, might not be an obvious place to find a fort. This coastal fortification, built to protect Portland Harbour, was one of the so-called Palmerston’s Follies. Suburban Militarism visited and reported another of these ‘follies’ a couple of years ago at Hurst Castle, opposite the Isle of Wight. Nothe Fort situated at the mouth of Weymouth Harbour’s entrance. In 1869, Napoleon III’s France began work on the construction of “La Gloire”, an Ironclad battleship. This was in part a deliberate challenge to Britain’s naval dominance, but it was also a response to the experiences of the Crimean War amongst other conflicts. The industrial revolution had changed and improved coastal artillery design improving range, accuracy and damage. As France signalled an ironclad challenge to the ‘wooden walls’ of Britain’s peerless navy, British coastal fortifications suddenly took on an importance they hadn’t had since Napoleonic times. A view of the inside of the fort at rampart level with Weymouth harbour and the south coast beyond. The ramparts and courtyard of Nothe Fort during my visit in 2017. The rear face of all the casemates at gun deck level are visible. x2 64 pounder rifled muzzle loaders (RMLs). x4 9 inch RMLs – firing 256 pound shells up to 3 miles. x6 10 inch RMLs – firing 400 pound shells up to 3 miles. x7 12.5 inch RMLs – firing 818 pound shells up to 3.5 miles. 64 Pounder RML – one of a number of scratch-built models of Nothe Fort’s Victorian guns crewed by men of the RA. On entering Nothe Fort, I was immediately confronted by one of these 64 pounder guns. Armstrong’s 64 Pounder Cannon was the first Rifled Muzzle Loading (RML) gun to enter British service. It is mounted on a wooden carriage with thick rope stays. Aiming was facilitated by iron wheels which ran along an iron track in the floor. The shells can be seen bottom left in my photo above. Two of them were installed in the fort specifically to protect the harbour entrance, hurling their 64 pound shells across the harbour and Weymouth Bay. They were in service from 1872 before being finally declared obsolete by 1908. This model was of the larger 9 inch RML gun with crew. Four of the casemates originally housed these 9 inch guns. One can see how much larger it was when comparing this model with the above model of the 64 pounder and crew. Unlike the 64 pounder, it is housed on an iron carriage to better cope with the increased weight and power. No replica or original of the 9 inch gun exists in the fort today, aside from this model. The model of the 10 inch RML with gun crew. One man in the foreground is wheeling the huge shell. 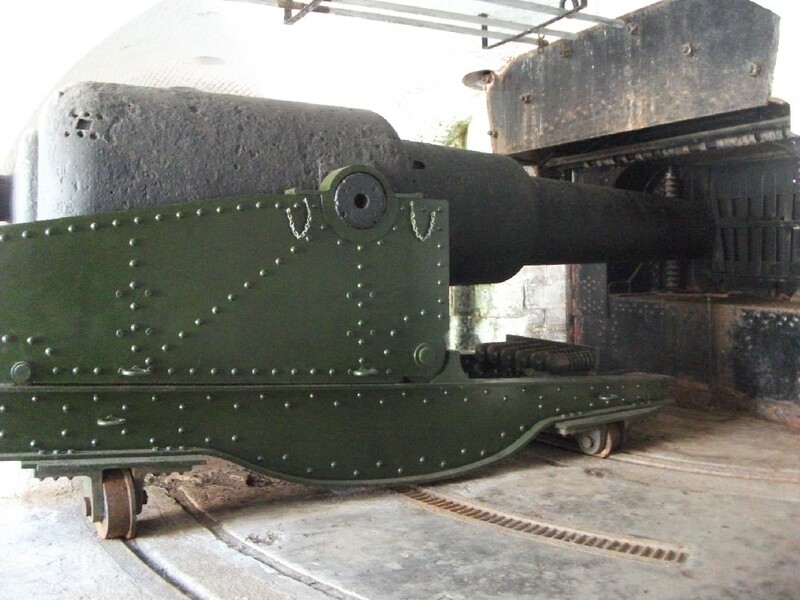 The 10 inch RMLs took up six of the casemates and were initially the largest guns in Nothe Fort until replaced by even larger calibre guns in the 1890s. The above model of the nine men of the Royal Artillery servicing the gun show them in shirt sleeves with pillbox hats. More men would be down in the tunnels of the magazine level supplying the crew with shells and cartridges. No replica or original existed in the museum. The massive 12.5 inch RML gun is a reproduction but is brilliantly impressive nonetheless, giving a real impression of the weight, size and sheer power of these monsters. The casemate which houses it had manikins dressed in period uniforms to provide a good impression of how the men of the Victorian Royal Artillery would have looked at this time. During this period, the Royal Artillery was divided into three arms, named respectively the Royal Field Artillery (RFA); the Royal Artillery (RA); and the Royal Garrison Artillery (RGA). It would have been the RGA (as specialists in siege and coastal artillery) which would have manned Nothe Fort, perhaps with some assistance from the local Artillery Volunteer Corps. Life-sized manikins provide a sense of scale of these giant coastal cannon. The manikins also helped to demonstrate something of the processes involved in serving such a large cannon. One of the manikins is pictured below wheeling the canvas-wrapped charge, packed with explosive, up to the muzzle and the massive ramrod can be just seen lying on the floor. Another man wheels over the heavy 818 pound shell. The embrasure is covered by a mantelet, a thick rope curtain, which would have been fully closed when loading the cannon and intended to protect the men from counter-battery fire, shrapnel and snipers. Men of the Royal Garrison Artillery were required to sleep and live on the gun decks. Nothe fort gave a nice impression of life in the barracks. The thin walls on the side facing the inner courtyard were quickly removed during gunnery practice and could remain so for days at a time. Consequently, their living quarters were liable to be somewhat open to the elements on one side – most unpleasant in winter time! The fort was particularly informative when it came to explaining how the guns were served with the constant flow of ammunition required to keep the enemy at bay. It all happened below the gun deck deep, down the magazine level’s tunnels which circumnavigated the whole fort. 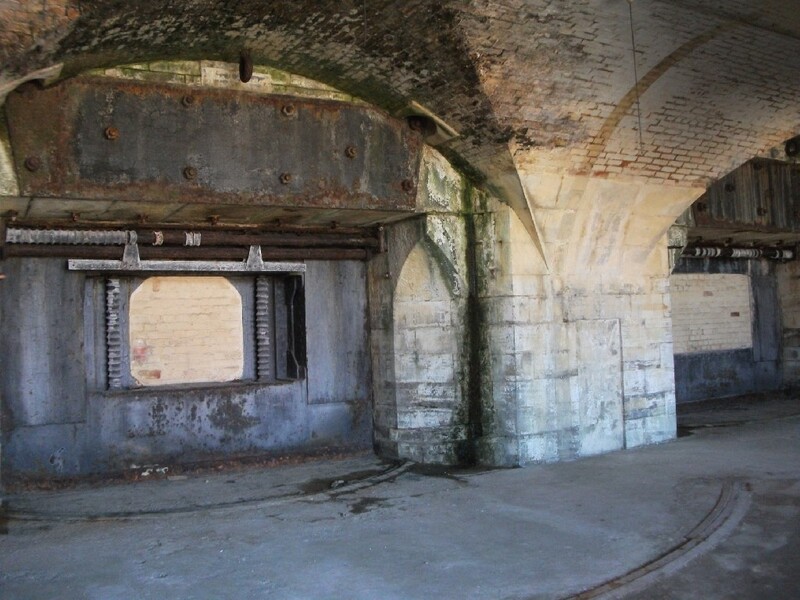 Nothe Fort has extensive tunnel systems, eerie and often deserted during my visit. The magazine level had the potential to be a source of total disaster for the fort. The very slightest of sparks could ignite the black powder stored there and destroy the fort from the inside. The risk was very real and the Royal Artillery took great precautions to prevent it from happening. Lamps were kept in special sealed cabinets embedded in the walls to prevent the naked flames becoming ignition sources and reaching the powder. Furthermore, the small room where black powder was stored and cartridges prepared were kept strictly separate from the rest of the fort. It was accessible only via a “shifting lobby”, a changing room where men would have to divest themselves of all their usual clothing and change into white clothing containing no potential sources of sparks instead (no metal buttons, badges, etc.). Heads were covered with cloth caps and even the shoes were canvas as hobnails in the soles could create tiny sparks on the floor. Men were not allowed to pass from one side of the lobby whilst wearing their usual uniform. Above we can see RGA uniforms in one lobby already hung up on the wall, their owners already changed and at work in the shifting lobby accessible through a side door. Once the cartridges were prepared, they were cased for safety and passed to the corridor through a small hatch low in the wall. Thereafter the charges were transferred carefully to a winch and hauled up to the gun deck. The shells were also separately winched to the gun deck from the nearby shell store. Shells in the shell store which was situated on the opposite side of the corridor from the shifting lobby. Shells did not need anything like the same level of precaution as the charges as they contained no explosive material. A manual 64 pounder shell hoist on the magazine deck used to transfer shells directly up to the gun deck. The heavy 12.5 inch shells, due to their great weight, had to be lifted up to the gun deck via special mechanical winches. Once the shells and cartridges were up on the gun deck, the gun crew would load them and continue to pour fire upon those enemy ships! 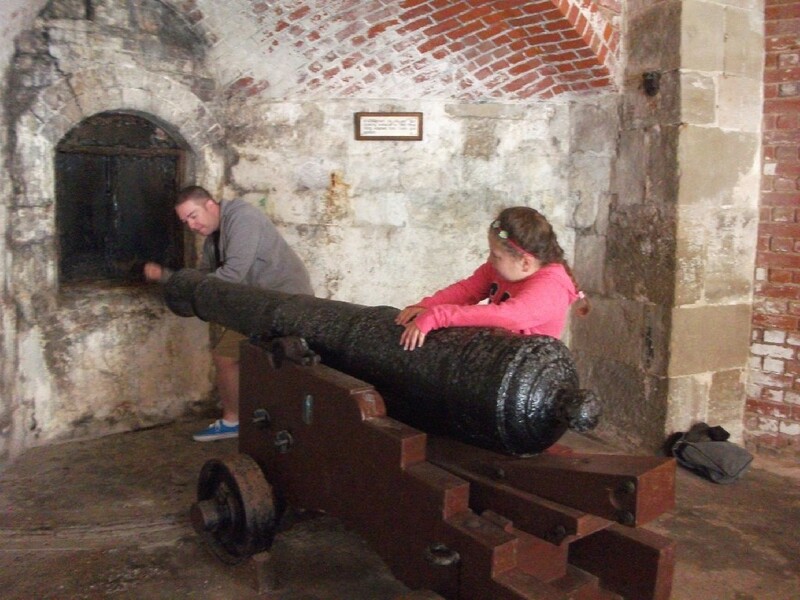 Nothe fort was built with what was the deadliest industrial armaments then available. It was industrial armament developments which soon brought about its demise, however. Naval technology put the balance of power once more back into the hands of the ships. Whilst even the most powerful Armstrong coastal gun could lob a shell 3.5 miles, a dreadnought battleship could hurl far more destructive shells at a much greater distance, meaning the fort could be destroyed by distant battleships with impunity. Palmerston’s follies showcased the immense fire power of a leading industrialised nation. They projected a Great Britain both brimming with confidence and yet at the same time fearful that its international pre-eminence would be challenged. These fortifications may have proved to have been follies, but their 21st century role as museums of coastal defence makes this military history nerd very content indeed. Suburban Militarism goes on holiday! I’ve returned from my holiday away much refreshed. I was hoping that my holiday by the sea might allow me to visit the Royal Marines museum in Southsea. Unfortunately, I didn’t quite get time for that but instead did enjoy a number of other military history related excursions, in addition to all the sun, sea, sand and horses that made up the vacation. Yes, you read that correctly – being based in England’s New Forest meant lots of wild ponies (which offered some further colour guidance in my Nappy cavalry project). Being based in Milford on Sea, I was but a short boat ride away from Hurst Castle, a Tudor castle that was expanded considerably during the Victorian era in response to French naval expansion. Situated on the end of the long sandy spit, the castle guards the approach of any naval craft passing between the Isle of Wight and the mainland (the key port of Southampton being just around the corner). This fort is one of Palmerston’s Follies, so-called as these coastal defences instituted by the Prime Minister were never used, the French threat having faded with their defeat in the Franco-Prussian War of 1870. It’s hard not to be awed by Victorian coastal defence. 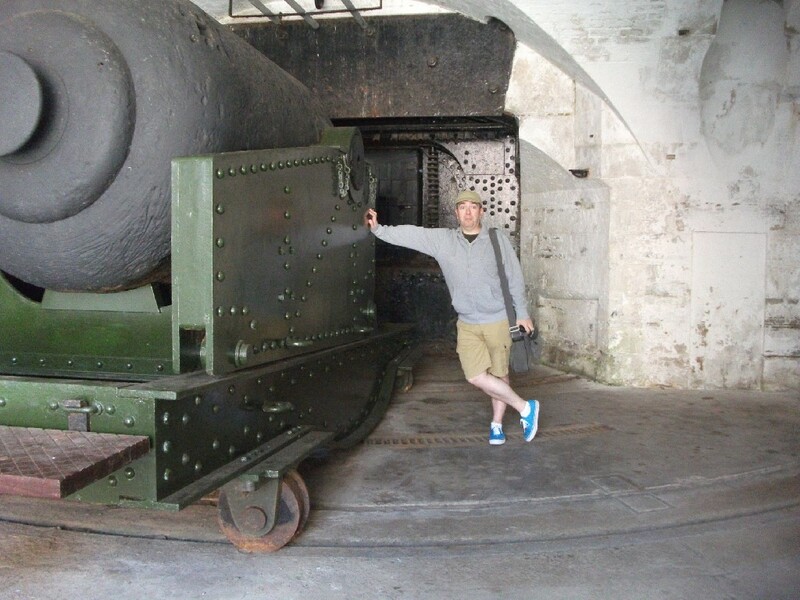 Upon entering Hurst Castle, I was immediately struck by the sight of some 38 tonne muzzle-loading cannon. These monsters hurled shells across the Solent weighing up to 820lbs which took 12 men up to 6 minutes to load. I’m not the tallest man in the world, but this pic gives an idea of scale! Thick rope curtains would have provided some protection for the gunners operating near the gunport. Being muzzle loaders, loading the shells from the front required the gunners to move the cannon back on steel sliders until there was room enough to do it. In the 1870s, this required operating a huge sponge to damp down the embers in the barrel, then loading the charge of gunpowder weighing 130lbs, followed next by a copper band spacer. By the turn of the century, a cordite charge would later make things a little lighter and therefore easier. A 38-tonne cannon! The metal grooves on the floor aided aiming. Finally, the enormous shell was loaded into the muzzle with the aid of a mechanical lifting mechanism. 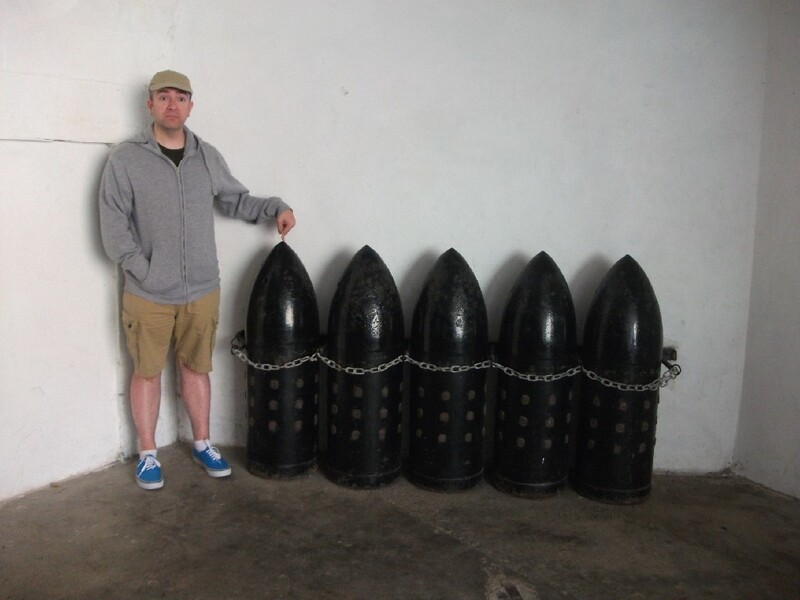 Yours truly with some of the shells! There must have been nearly fifty of these gunports around the castle, housing 10 of these 38 ton cannons and many more of various calibre. I wouldn’t have wanted to be on the receiving end of whatever punishment they were capable of dealing out through them, ironclad or no ironclad! One of the now bricked-up gunports on show without any cannon obscuring it. Before Lord Palmerston instigated his grand designs, it was a polygonal (12-sided) Tudor fort, built by Henry VIII to counter the Catholic threat following his break with Rome. Like Palmerston’s version, it was never seriously tested, although a stray Spanish vessel was wrecked by a storm on to the nearby beach during the Armada threat. It thereafter had periods of both ruin and refurbishment. At the end of the English Civil War, this Parliamentarian stronghold was notably the last prison of the captive King Charles I, before he eventually left for London and the executioner’s block. My daughter aiming a Tudor cannon while I ram home the shot! 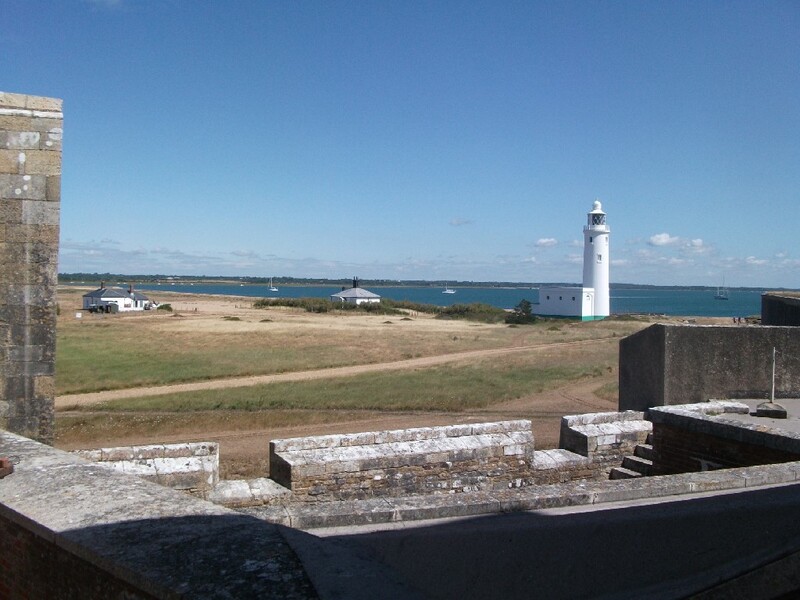 Looking out from the old Tudor keep towards the Hurst lighthouse and the mainland. 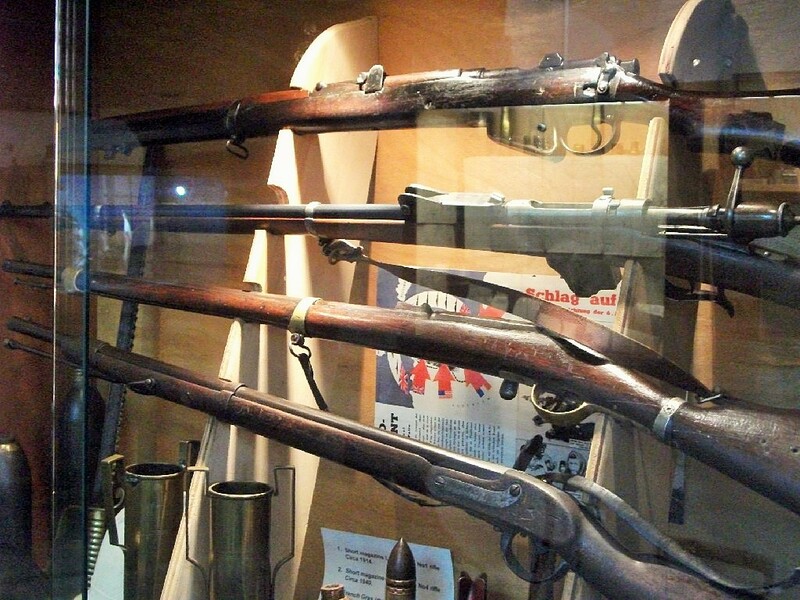 Weaponry on show included Lee-Enfields, French Gras Chassepots, Belgian muskets, and others. 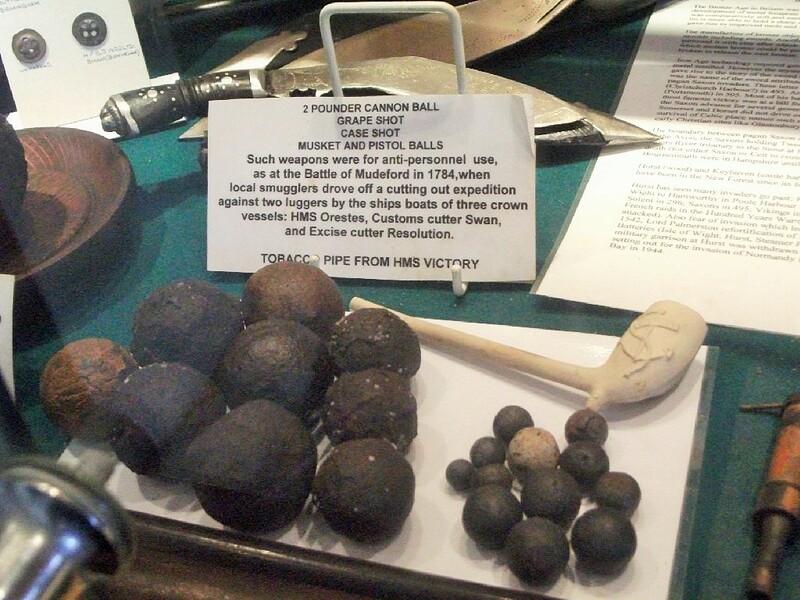 Examples of cannon balls and shot of the type used in the Battle of Mudeford 1784 against smugglers (which the smugglers won)… Also a ‘pipe from HMS Victory’. Just a few more military-related nuggets to share in a future post that I discovered whilst on holiday. Thereafter, due to family and work commitments, there may a brief hiatus before I can finally get back at last to the modelling!